If there’s any doubt about just how durable and trouble-free hybrid batteries are just visit Vancouver, Canada, where more than 80-percent of the city’s taxi fleet is Toyota Prius Hybrids of various model years. The Prius taxi that took me downtown from the airport was a 2007 model with more than 200,000 miles on the odometer. The driver told me he had to change the battery recently — the conventional one that starts the motor — not the hybrid battery pack. The taxi driver told me a buddy of his has logged more than 600,000 miles on his Prius, which needed a new hybrid battery after 350,000 miles. That driver, I was told, bought a used battery from the U.S. 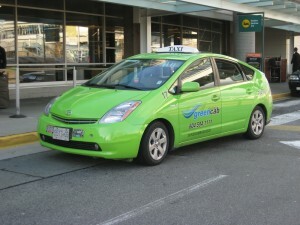 It seems that many of Vancouver’s Toyota Prius taxis, and replacement batteries, are bought used from the United States, because the demand for Prius hybrids in Vancouver exceeds the supply. Toyota offers an 8-year/100,000-mile warranty on the HV battery. Considering the fact that these Vancouver taxis are far exceeding their expected lifespan, Toyota should be using these vehicles for real-life testing and market research. When the batteries do finally wear out, one of the world’s largest recycling facilities is just down the road, located in Trail, British Columbia. The nickel in nickel-metal-hydride batteries, and the lithium in newer lithium-ion batteries for hybrid and electric cars, are valuable enough to re-process and re-use. Japan also is researching how to re-purpose such spent batteries, mainly as back-up energy storage for emergency power, perhaps replacing generators by hospitals. My hybrid taxi driver volunteered he loves that his Prius is hardly ever in the shop; unlike the conventional gas-powered Chevy he used to drive. Even more, he loves its fuel economy. He gets roughly 60 miles per gallon. This is an important efficiency, since gas cost between $1.20 and $1.29 in Vancouver. That’s per liter, which converts to around $5 a gallon (the Canadian dollar and the U.S. dollar are on par these days). And that was before the unrest in the Mideast began pushing up the price of oil. It’s not just the taxis in Vancouver that are hybrid. Nearly every government vehicle is as well, including Ford Escape Hybrids and Toyota Highlander Hybrids, operated by the provincial British Columbia forestry service and other agencies. Green cars and other public transportation are part of the legacy of the 2010 Winter Olympic Games in Vancouver. At the sprawling Whistler-Blackcomb ski resort 90 minutes from downtown, shuttle buses are powered by hydrogen fuel cells manufactured by a local company, Ballard Power Systems, the world’s leading manufacturer of heavy-duty fuel cells. Ballard fuel cells also power municipal buses in Belgium, Norway and other countries that place a premium on reducing carbon emissions. Until Toyota rewrote the playbook with its hybrid technology, fuel cells were the golden child, offering the promise of freedom from imported oil. Companies including Ford, General Motors and Daimler/Mercedes-Benz invested hundreds of millions of dollars in Ballard research and technology in the last decade. The driver of the fuel cell bus I hopped aboard in Whistler-Blackcomb told me he has mixed feelings about the new technology. He said it is easier to drive, since it has fewer gears and no clutch, is much quieter, and responds more quickly because it is so much lighter than a conventional bus. However, he also said it has less accelerating power than a diesel, and can be sluggish going up steep hills. Even so, he said he and his fellow bus drivers support the zero-emission buses. 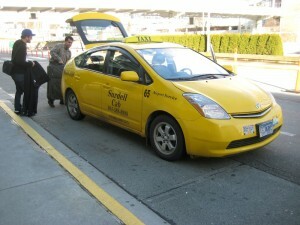 Photos courtesy Evelyn Kanter: In Vancouver more than 80-percent of the city’s taxi fleet is Toyota Prius Hybrids. Toyota offers an 8-year/100,000-mile warranty on the HV battery. One of the world’s largest recycling facilities is located in British Columbia. This entry was posted in Green Wheeling, Rely on the Auto Experts -- Motor Matters Reviews. Bookmark the permalink.